Your Texas Legends are 31 games into the 2018-2019 season, and the G-League regular season consists of 50 games. So this is kind of the halfway mark; a mid-season update, if you will, on your favorite basketball team in Frisco. In order to give you an inbounds pass to what you might have missed, here are seven key points that have occurred in the first seven weeks. The Legends have a winning record at home, winning nine out of fourteen games so far this season. Unfortunately, currently sitting at 11-20, this means that the road has been a prickly pear for the team this season. That can be understandable (though I’m sure the Legends will tell you unacceptable) considering the inevitable roster turnover and travel accommodations at this level of pro ball. Sometimes it’s not just a pun that you can be penalized for traveling in the game of basketball. Fortunately, this means that the Legends will have more home games than road games in the last 19 games this season to draw off of the home crowd advantage the fans here give them and hopefully start stacking up some more wins along the way. So how can you help the team with their home court advantage? By being there to support them, of course. I mean, maybe deep contemplation or a cauldron full of eye of newt might help, but it’s not proven. Being at one of the best in-person sporting events in town and cheering on the team you like better than your kids’ teams seems way more reasonable and just think of how many newts you could rescue from blindness by doing so? That’s a win-win. Single game tickets are still available, and the Legends offer some ticket promotions like $5 Fridays and Dollar Beer Wednesdays. You have about two months left in the season. Something worth contemplating. Legends head Coach Bob MacKinnon hit a milestone with a Legends victory January 16th. The win was his 200th as a G League head coach. Coach MacKinnon is a basketball lifer, coaching over three decades in various ports of call, including winning a G League (then D-League) championship with the Colorado 14ers. Oddly enough, the 14ers aren’t in Colorado anymore. They’re right here in Frisco as your very own Texas Legends. So yeah. This guy’s kind of a big deal for the franchise. Since my season preview published in November, six of the original 13 players to start the season have found different jerseys to wear and different organizations to play for. Jameel Warney, a Legends legend, was traded to the Westchester Knicks. Another (relatively) longtime Legends player J.J. Avila was traded to the Agua Caliente Clippers of Ontario, California. Back on track, Rashad Vaughn was traded to the Delaware Blue Coats, and Codi Miller-McIntyre (whose overall game I very much admired because he did it all and I wish him the best) found an opportunity with Zenit Saint Petersburg in Russia. You can’t rightly field a professional basketball team with only seven remaining players, so who do you fill those available jerseys with? Other players from other walks of life all striving to fulfill a common dream and reach a common goal. Xavier Rathan-Mayes (acquired in the Warney trade) is a crafty Canadian who, while a Seminole at Florida State, once scored 30 points in less than five minutes at the end of a game. A Legendary performance, you might say. Other roster spots have been filled by Trahson Burrell, Asauhn Dixon-Tatum, and C.J. Leslie. 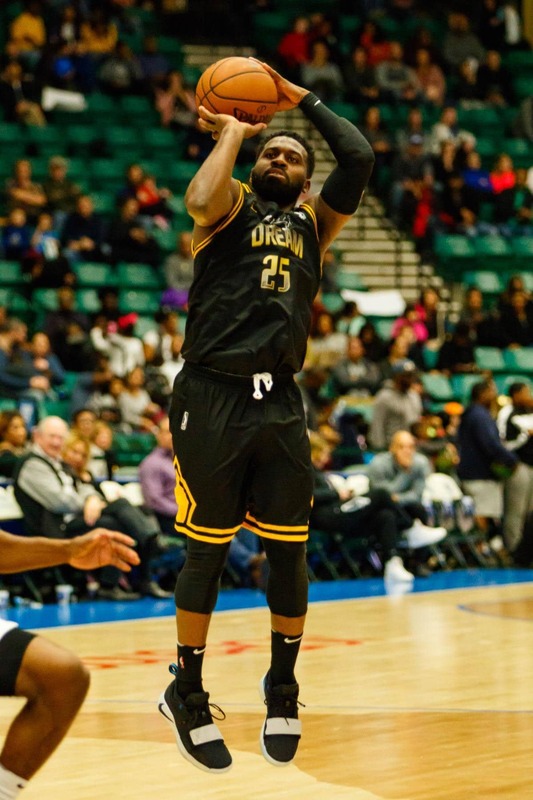 And then there’s Justin Dentmon, who is back with the Legends for the fifth time in his decade-long career that has carried him from the NBA to the G League to Turkey to Puerto Rico to Italy to, well, you get the point. The guy clearly loves to play basketball. It’s players like this either on the Legends roster or passing through to play against the Legends that make the on-court experience so refreshing and enjoyable. There’s a purity to the reason they are out there. These guys still love the game they’ve loved since they were kids. The Texas Legends are doing their part to foster that same love for the game in the youth of the local community. Check out the Jr. Legends program for information on their basketball camps, which unfortunately don’t allow grown men who write about the Legends to participate, and their community clinics aimed at providing a free opportunity to promote health, sportsmanship, and a positive attitude to after-school programs, recreation centers, and Salvation Army locations. If you’d rather celebrate the game from the sidelines while also celebrating your special day, the Texas Legends offer birthday packages, and if I’m not mistaken these offers do allow grown men who write about the Legends. Take in a game, take in some food and drinks, and blow out the candles at a Legends game. Seriously. Blow out the candles. This is a high-occupancy facility, and that’s a fire hazard. Whether you’re an actual child or a grown man who writes about the Legends who still wishes he was a child, the Texas Legends offer many ways to engage with the team and the sport from now until the end of the season. If you aren’t aware by now, the Texas Legends organization is very involved in the community and another example of this is the Mission of the Month presented by Legacy Plumbing. Each month a different non-profit in the area is selected to receive very much needed donations. This month’s mission is Mazie’s Mission, a nonprofit veterinary clinic focused solely on providing quality care for pets in the rescue system. I love this cause since I have rescued seven cats in my adult life (not simultaneously, so keep your jokes to yourself). The Legends have supported school supply drives for Frisco ISD, gift donations for Toys for Tots, food and coat drives for Frisco Family Services, and others to fill the charity stat sheet. Check back each month to see the next worthy mission to help a community non-profit. Even if you can’t make it to a game, you can make a difference. I had a journalism professor my sophomore year of college that told the class that she wouldn’t be giving a passing grade to an editorial that was submitted as a bulleted or numbered top-ten kind of list. She said it was lazy and uninspired. The lesson stuck with me for two reasons. She followed that up by giving us a list of ten ways we could improve our writing instead of doing a top-ten list. I waited to see if the irony was intentional. I’m still waiting. The other reason is that if a top-ten is lazy, what if I just wrote a list only went to seven? Should I have gone to eleven to show ambition? Has this season turned out the way the Legends would have hoped on the court? I doubt anyone in the organization would say it has. But there have been ambition and some very bright spots. On second thought, that’s a bad idea. Instead, go show your children that this is why you play the game. It’s hard work. It’s dedication. It’s not always glamorous. It’s not always dreamy. But it’s still a dream worth playing for because you love it. And it’s only mid-season. There’re still more games to play. And attend. And love. Oh, and save a newt’s eyesight. Just get to a game and cheer on your Texas Legends.